A mini-series about the real-life Hitler Diaries hoax based on Robert Harris’s 1986 book Selling Hitler: The Story of the Hitler Diaries. 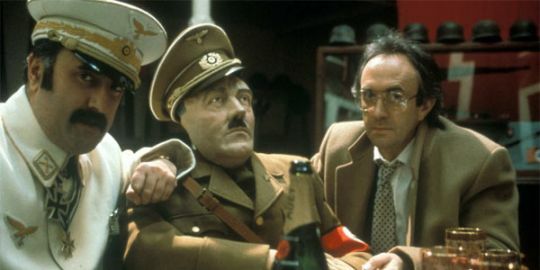 In 1981, Gerd Heidemann (Jonathan Pryce), a war correspondent and reporter with the German magazine Stern, makes what he believes is the literary and historical scoop of the century, the personal diaries of Adolf Hitler. Over the next two years, Heidemann and the senior management figures at Stern secretly pay 10 million German marks to a mysterious ‘Dr Fischer’ (Alexei Sayle) for the sixty volumes of ‘Hitler’s diaries’, plus a ‘special volume’ about Rudolf Hess’s flight to the United Kingdom, covering the period from 1932 to 1945. Some of the money is made as payment to Dr Fischer, but the larger proportion goes into Heidemann’s own pocket, to finance his extravagant lifestyle and collection of World War II memorabilia, including the yacht of Hermann Göring. However, to the dismay of all, including eminent historians such as Hugh Trevor-Roper (Alan Bennett) who verified the diaries are authentic, after the first extract is published it is revealed that the diaries are crude forgeries, faked by Stuttgart criminal Konrad Kujau. Gerd Heidemann: JONATHAN PRYCE; Konrad ‘Conny’ Fischer: ALEXEI SAYLE; Gina Heidemann: ALISON DOODY; Edith Lieblang: JULIE T. WALLACE; Henri Nannen: RICHARD WILSON; Peter Koch: OLIVIER PIERRE; Thomas Walde: PETER CAPALDI; Manfred Fischer: TOM BAKER; Sir Hugh Trevor-Roper: ALAN BENNETT; Rupert Murdoch: BARRY HUMPHRIES.